Another month has passed and although my intentions were to activate VK2/SY-002 that did not happen, maybe next month. It’s surprising just how quickly time gets away. However, on a much more positive note, I did manage to make 71 SOTA contacts during the month, totaling 418 chaser points. A far better result than last month. What surprises me the most, was I made at least one contact on nearly every day of the month. Now that means there are dedicated activators out there, bush bashing their way to mountain tops just so us chasers can claim a few more points. Their efforts are greatly appreciated by us all. The highlight of the month for me was a contact into VK9 Lord Howe Island. It was the evening of 22Nov14 when contact was made to Wayne VK3WAM/P9 on VK9/LH-004 Malabar Hill. And to make the contact even more memorable it was CW, G599 R589 on 14.062MHz. My very first contact with Lord Howe Island in 28 years of Amateur Radio. Well that’s all for this month, I do hope every one has a very happy and safe Christmas and we all catch up again in the New Year. Last month I wrote “September 2014 has been a fantastic month for SOTA activity.” Well October was a fantastic month as well however, not so much as far as my SOTA activity was concerned. There were only 14 contacts for the month and 81 chaser point added. I was off the air for most of the month, my wife and I traveled to Burleigh Heads in QLD to visit our son and took a couple of weeks in doing so. We traveled just over 2,500 kilometers and enjoy all the placed we visited along the way. Although, I was able to enjoy another of my obsessions, which is Geocaching. If you don’t know what Geocaching is all about, check out their website http://www.geocaching.com but I warn you, it can be very addictive. Well that’s all the report for now, hopefully I can catch up with you on air and even complete the activation of VK2/SY-002 in November. September 2014 has been a fantastic month for SOTA activity. During the month I made 85 contacts which covered three bands 7, 10 and 14MHz, seven CW contacts, and five contacts with DX stations. They were, 2E0YYY Mike x 2, M0IML Barry, G4WSB Bill and OE9HRV Herbert. 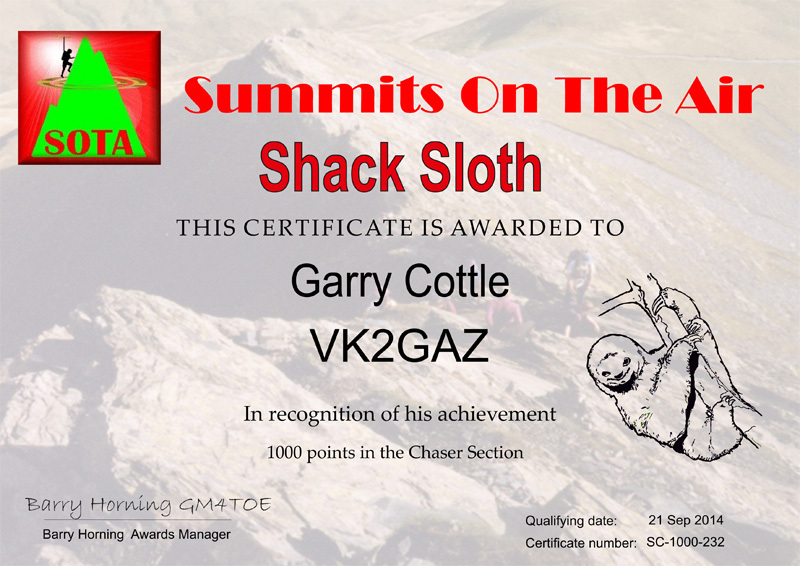 After seven months of SOTA activity on the 21st September 2014 I finally accumulated the required 1,000 points to qualify as a SOTA Shack Sloth. As you will all know, if was not for those dedicated Amateurs Radio Operators who go out week after week and activate far off hill tops, we Sloths would not exist. Many thanks to all who enabled me to gain the 1,000 points. 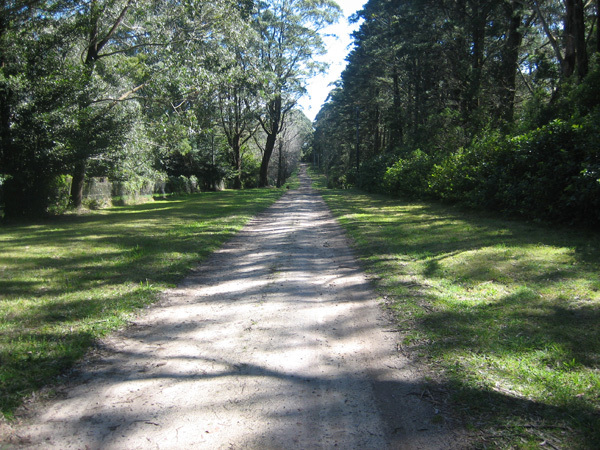 During the month I also had the opportunity to go camping at Corrimal on the south coast of NSW. Most evenings the dipole was set up and the new FT-857 was brought into service. Running 20 watts, many contacts were made into VK1, 2, 3, 5 and DX some SOTA ones among them. Well that’s all for now, looking forward to many more contacts to come. After a few weeks of on and off showers and cold weather I was truly blessed this morning, the drive from home to GZ was sunny and pleasant and the weather only improved as the morning progressed. The site is easily assessable, setting my station up using the star pickets of the fence line to support the squid pole and dipole antenna. 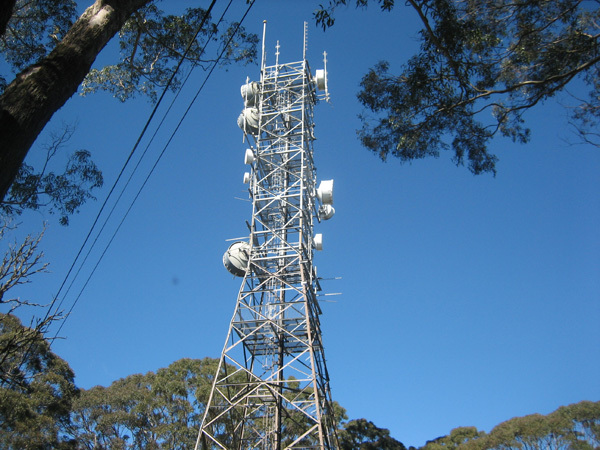 I was a little anxious the nearby tower would produce interference to the portable set however, my fears were misguided and the noise levels were very low. There was however, a considerable amount of QSB on the band and this only intensified with time. I started calling CQ at about 23:20 and it was not long before Peter VK3PF was first in the log, this followed with plenty of contacts totalling 20 in all before role over. Role over had Peter VK3FPSR calling me as he had other fish to fry and needed to make the contact and get away. By this time the band had degraded considerably, with signal reports down from 30 minutes previously. Another 10 contacts were made before the frequency went quiet and it was time to pack up and return home. Still fine tuning the amount of gear taken along, those items carried “just in case”. On my next activation I will be taking ONLY the bare necessities. Another wonderful morning to be out and about. Below is a list of the contacts for the morning. I decided late on Saturday, 23 Aug 14t to drive out to Canoelands VK2/SY-001 and make the activation, it had been raining most of the week and I was not sure if the weather would hold. 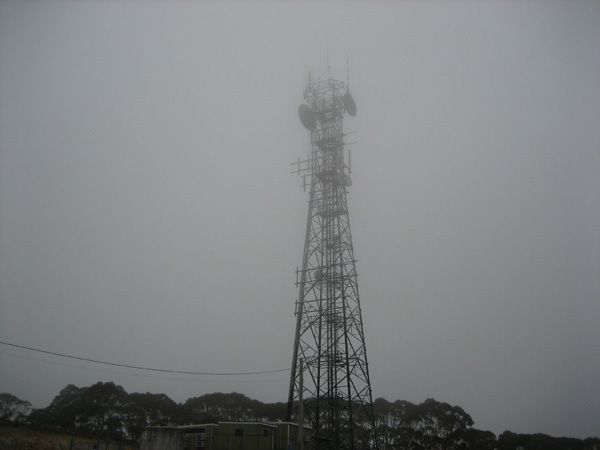 Sunday morning at my QTH was very overcast and foggy however, what the heck, it would be a nice drive, even if the weather was not favourable. Much to my delight, the closer I got to GZ the better the weather became. VK2/SY-001 at 278 meters ASL is situated on private land however there is plenty of scope to locate a suitable activation site within the 25 meter level. I selected a location at S33 30.386, E151 03.484 which is 256 meters ASL and still within the required parameters. Just as I arrived the local land owner was approaching in his trusty ute, so I asked permission to use the land and he was more than obliging. The gear selected for today’s activation was my trusty FT-817, Z11 Auto Tuner and Dipole supported by a 9 meter squid pole. I have been very surprised and delighted with results of the FT-817, only running 5 watts, it’s an amazing little rig. After setting up the first contact was Andrew VK2UH at 23:56, he was kind enough to spot for me, I did not have Optus coverage at this location. The only STS was with Andrew VK1NAM on VK1/AC-026 with 5/9 signal reports both ways. A steady stream of contacts was made until 00:15 when it was time to go QRT, pack up and return home. You can never be over prepared. Here is a list of the contacts for the morning. Have been looking forward to this activation, it is the first I have attempted on my own. 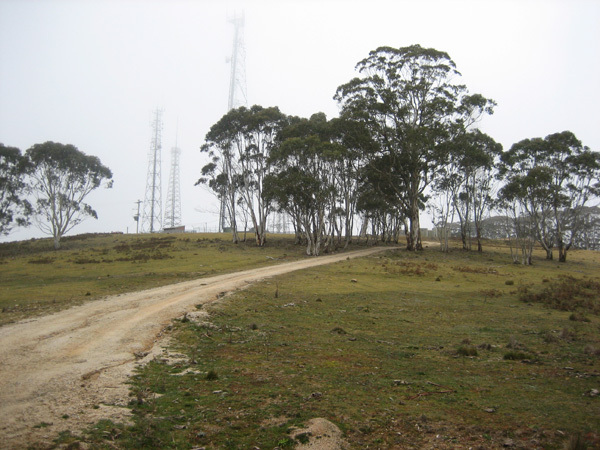 Mount Lambie was chosen as it is not too far from my QTH, a little over 100 kilometers. Also, it looked reasonably accessible from the images on Google Maps and from others who had posted their blogs. I left home early and even with taking a wrong turn and ending up at Rydal and having to retrace my steps, I arrived at Mount Lambie way too early. The plan was to arrive, setup and make the first CQ call at around 23:30. Well the setup was complete in quick time and the first contact was recorded at 22:38. A total of 24 contacts were made, VK3 – 12, VK2 – 6, VK1 – 3 and VK5 – 3. Nearly all signal were very good, mostly 5/9 except for one period of time when a lot of QSB was experienced and the signals fell away only to return again later. Mount Lambie was a great location for my first solo activation, easily accessible, not a lot of walking to make the top and noise levels were surprisingly low which makes portable operation all the better. The forecast rain held off however the mountain top was covered in cloud and the gentle breeze made condition very cool indeed. I missed getting back to an operator who called in on CW. In my hast I did not record his/her callsign and as I did not have a key could not call the person in. If anyone knows who the operator was, please contact me so I can set the record straight. To the person I missed I am very sorry. Thanks to Andrew VK1NAM I have located the person who I missed calling on CW, it was Warren VK3KS. By the way, Warren VK3KS was RST 599. Here is my log of the activation. I later drove to Bathurst and setup on top of Mount Panorama, making a few contacts with guys and gals participating in the Remembrance Day Contest and a few operating from Lighthouses. Well 7 contacts to date this month, earning another 20 points toward my Sloth Award, getting there slowly. 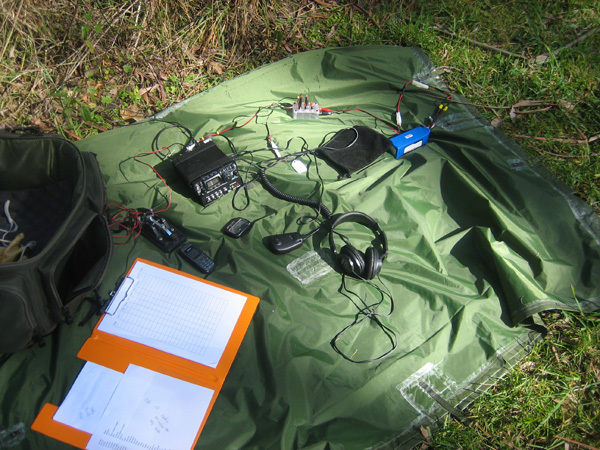 This morning it was very nice to make two CW contacts, one before and one after roll over, with Samuel VK2AFA/P on VK2/HU-074, Mt Richardson. I should know better however, logging SOTA contacts has been less than organized. To date some contacts are recorded in a book while others have been scribbled on pieces of paper. It’s about time to become far more organized and record my SOTA contacts in a far more orderly fashion. These are my contacts for August 2014, many more to come I hope. 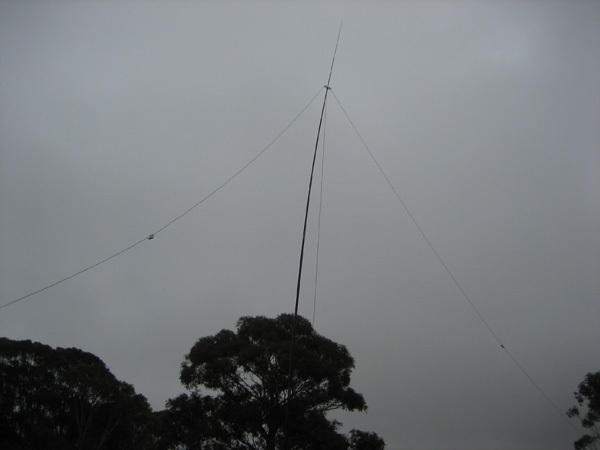 Off to activate Mt Lambie VK2/CT-007 next weekend 15 – 16 August 2014. Should be very interesting with the Remembrance Day Contest and the International Lighthouse Lightship Weekend being run at the same time.